The most appalling take on the Ukraine crisis belongs to Putin apologist Stephen F. Cohen, and the most facile the hordes of commenters who anthropomorphically equate a leader’s bluster to the success of his foreign policy. But surely the most weirdly myopic response comes from Justinian A. Jampol, who takes to the New York Times to fret at Ukrainian protestors destroying statues of Lenin. 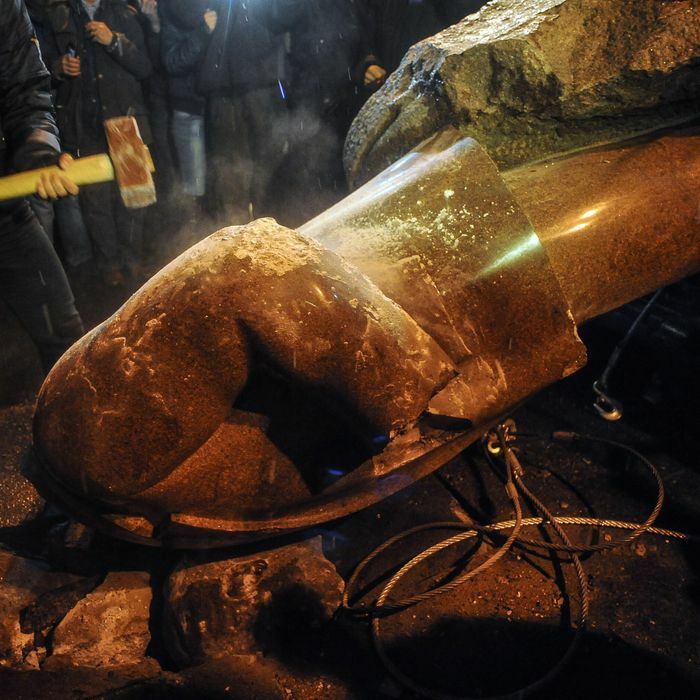 As Ukraine’s president fled Kiev and protesters roamed his mansion and took over the capital, old statues of Vladimir Lenin were toppled and dragged through the streets in several Ukrainian cities. The vandalism and destruction of Lenin statues across Ukraine is only the latest attack on symbols of the old Soviet state and its Eastern European satellites. Apparently Ukrainians still hold a grudge against Lenin merely because his regime invaded their country and murdered millions of people by engineering a deliberate famine. Jampol doesn’t defend Lenin, or Putin. He begins by asserting that destroying Lenin statues will make people feel better but won’t change the fact that Ukraine is still located next to a huge, nasty country that wants to dominate it (“while it surely is a captivating media moment and will perhaps galvanize like-minded protesters, it isn’t likely to play a positive role in helping Ukrainians to come to terms with their complicated past and it is certainly not going to change the reality of Ukraine’s geographic happenstance, sandwiched between Russia and the European Union”). Once historical sites and statues are gone, they do not come back. This is not just unfortunate for historians and museums but also for those whose history (whether glorious or uncomfortable) is being destroyed. Oh, won’t someone think of the museum curators? We eagerly anticipate the Times commissioning a revisionist account of Hitler and Stalin by the director of the American Mustache Institute.